The cool wet weather we have had the past couple of weeks has really slowed down the Hopper bite; but with hot dry weather and some higher river flows returning the Hopper fishing has really picked-up and should remain good into October. Yesterday Bo had a day off so we spent the day fly fishing with good friend Paul Broddick. Early on it was foggy on the river so the boys spent the morning slinging streamers and “Chuck’s Chunk” scored big! Bo decided to spend the afternoon firing a Hopper with a Sage One 6wt. 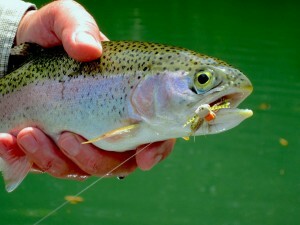 The little Rainbow pictured here was not the biggest fish of the afternoon; but he was certainly the prettiest. Hopper fishing can be hard work; but there is just nothing cooler that a big trout coming up slurping your big ole hopper. If you want to give it a try just book a trip with us a Empty Creel Fly Fishing Guides and Outfitter and we will show you how it is done.